Get a Behind the Scenes look at Sister Surf-Punk band Fiji-13, Real College Radio-style, presented by Radio K! Recorded 10.06.17. Rapper Tufawon joined us in Studio K on September 22nd. Here is some behind the scenes footage of his time at the station! Singer/songwriter Jessica Manning joined us in Studio K on September 15th. Here is some behind the scenes footage of her time at the station! Alternative rock group Fury Things joined us in Studio K on September 8th. Featured here is behind the scenes footage at Radio K! 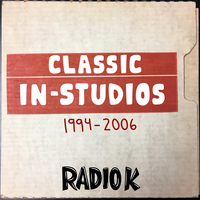 Indie group Candid Kid joined us in Studio K on September 1st. Here is some behind the scenes footage of their time at the station! Indie group WTF joined us in Studio K on August 25th. Here is some behind the scenes footage of their time at the station! Minneapolis punk band Buildings joined us in Studio K on August 18th. Here is some behind the scenes footage of their time at the station! Minneapolis Rock n' Roll band YANA joined us in Studio K on August 11th. Here is some behind the scenes footage of their time at the station!